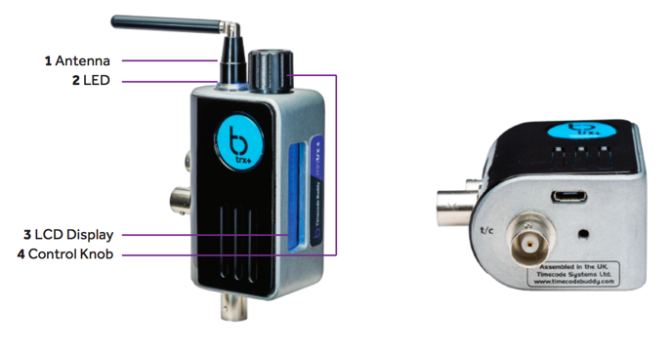 This is a guided tour of your highly accurate timecode, genlock and Wordclock generator and multi-channel digital timecode transceiver with B:LINK slave functionality. The Timecode Systems: minitrx+ settings are accessed and controlled from the front panel using the control knob and LCD display. For the digital transceiver module operating in 870MHz (CE), 915MHz (FCC/IC) and 920MHz (ARIB) bands. Glows either blue, green or red. Shows the unit&apos;s status and settings. Allows one finger navigation through menus.